My daughter loves cats, I mean she REALLY loves cats. We do have real cats yes, but she also has stuffed cats, porcelain cats, toy cats, books about cats, you name it. And now she even has a nice soft fleece cat blanket. We got it in the twin size and it more than covers her entire bed. She loves that she can cuddle up in bed surrounded by kitties. I love to see her happy. 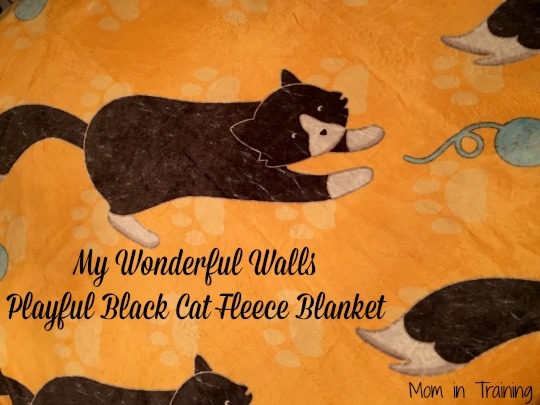 • Soft and snuggly bedding for animal themed room or kitty cat decor! One thing I really like about My Wonderful Walls is that they offer coordinating items so you don't just have the option to buy a cat blanket, you can also get a matching throw pillow. You can even get stickers or stencils to decorate your walls to go along with the kitty theme. What originally started out as a small, homegrown stencil and decal company, primarily to help artistically-challenged parents of young children, soon grew into a blossoming world of gorgeous home decor for people ages 0-100! This year, in 2015, we are excited to announce that we will be adding pillows, prints, blankets, and other home decor to our wonderful collection, making it even easier to complete your perfect look with just the right coordinating accents! At My Wonderful Walls we believe in creativity, big imaginations, and having fun. That's why we take pride in offering high quality, made in the USA, eco-friendly products at affordable prices. Every order is hand made with love, in the scenic city of Chattanooga, Tennessee and shipped to you pronto! And, YES, we ship all over the world! So, whether you reside in the U.S., Iceland or Peru, we make it easy for your walls to be wonderful too! Win it: Three lucky readers will each win a $100 My Wonderful Walls e-gift card. This giveaway will end July 22nd at 11:59 PM EST. The winner will have 24 hours to respond to my email. If no response, a new winner will be chosen. Prize fulfillment will be made by the sponsor, I am not responsible for prize delivery or lost or stolen deliveries. Open to residents of the US. I love the Cat Wall Stickers. I really like the DIVINE BUTTERFLIES MANDALA COLORME DECAL BY VALENTINA HARPER. Thanks. I love the They Explored the Valley of the Monarch Butterflies Decal - Ethereal Wall Art by Elise Mahan. So pretty! I love this one Zen Digital Art Decal - Inner Tranquility by Christopher Beikmann, its so relaxing.. I love the Cat and Dog Wall Sticker and the Siamese Cat Pillow for my daughter's room! Super Cute! The Chain Rope Pattern Wall Stencil seems really cool to me!